What a pitiful sight! This is what I saw when I arrived to rescue Tigger. 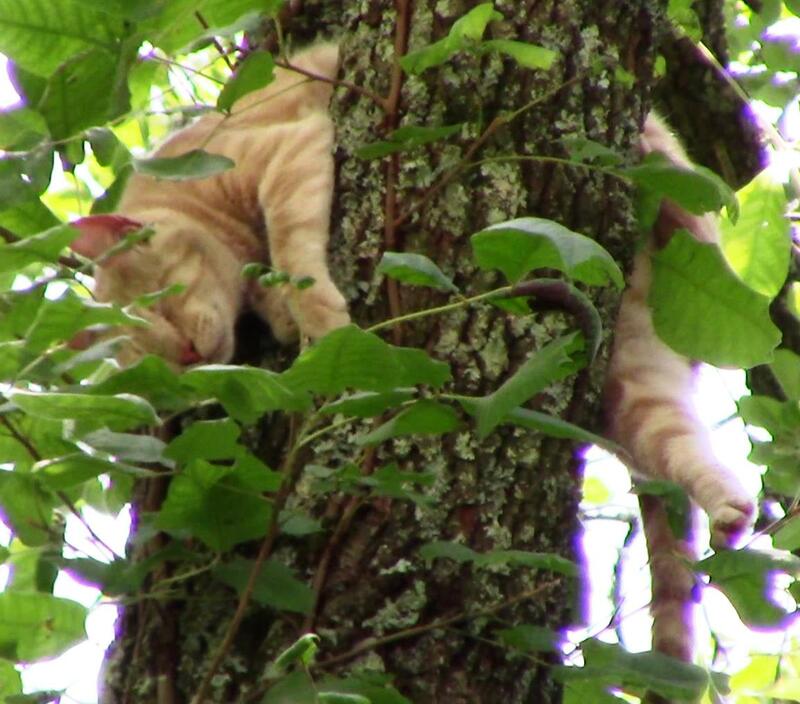 This poor one-year old orange tabby had been stuck forty feet high in a tree for five very hot days in July. A rain storm would have been a welcome relief, but it never came for Tigger. He was totally exhausted. Draped as he was over that large fork in the tree, Tigger was not likely to ever fall out of the tree. 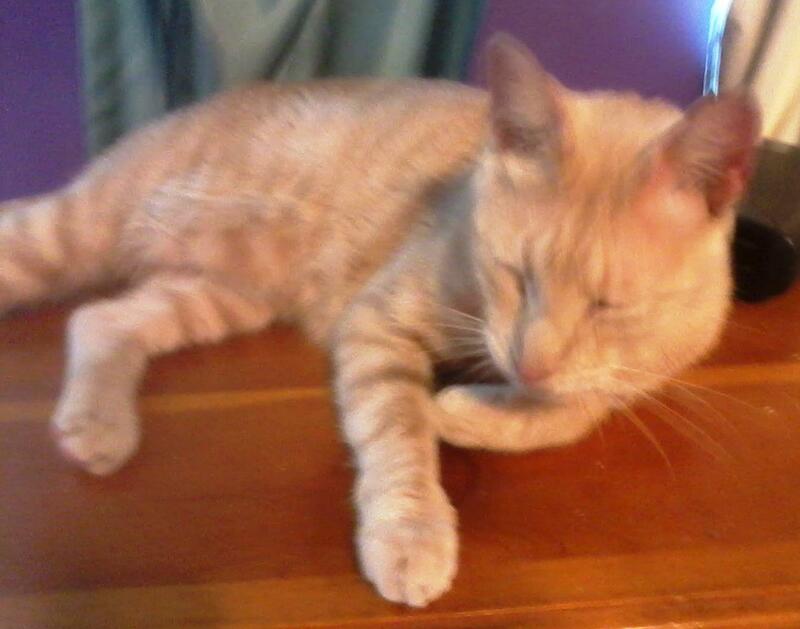 When his human daddy, Mitch, would call for him, normally he would respond with excitement, but now he could not even open his eyes, much less move. Tigger loves his daddy and sleeps with him every night. When Tigger was only a few weeks old, Mitch found him injured on the side of the road and near death. Mitch ignored the vet's euthanasia recommendation and instead took him home, fed him with a syringe, and nursed him back to health. Tigger owes his life to Mitch, and now, once again, they are in a similar position. Once again, Mitch did not let him down. When I asked Mitch how Tigger responds to strangers, he responded without any hesitation that Tigger runs and hides. It was a pretty safe bet that Tigger would not be cooperative with me, but I always hope to be pleasantly surprised. 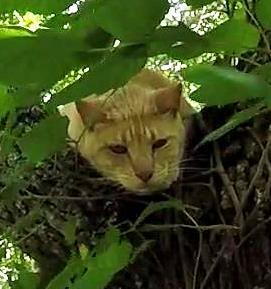 Still I had to be prepared for the likelihood that Tigger would respond to my approach by climbing higher in the tree. In this tree, Tigger had several routes he could take to get much higher away from me, and if he did, this rescue could take a very long time. I took my time climbing up to Tigger. I did not want to scare him and give him any reason to climb higher. I stopped at several points along the way to give him time to get used to me, and I talked to him calmly the whole time. The scowl on his face and the tone in his voice let me know that he was feeling stressed by my approach, but, to my relief, he stayed in place as he watched me climb close to him. Still, I knew that he could bolt up higher in an instant if he felt threatened. He may be exhausted, but adrenaline is a powerful drug. He seemed to tolerate my presence a few feet away, but when I reached my hand toward him, he turned around and looked for an exit. I pulled back and gave him time to calm down while feeling very lucky that he did not go higher. I gave him some more time to settle down and decided that I should offer him some food. I was hoping that offering food would help him regard me in a more positive light, but I could not have been more wrong. As soon as he saw my hand holding the food moving slowly in his direction, he immediately turned around and began climbing down the tree. I was so relieved that he was going down instead of up, but I knew he would not likely make it all the way down without falling. Indeed, he did fall, but by that time he had made it down to a height of about 20 feet. I could not see him well, but I watched as he fell, landed safely on the ground, and ran off into the woods. Tigger appeared just fine. I discouraged Mitch from going after him, because when a cat is in that mode of fearful flight, the more you go after him, the more likely he is to keep running. So I suggested that he should just ignore his natural inclination and stay put. But I also worried about Tigger getting lost or running up another tree. The best thing for me to do at that point was to leave as quickly as possible so that Tigger would feel safe to return. So I came down, packed up and left after asking Mitch to please call or text me when Tigger returns. Thirty minutes after I left, Tigger returned. I was so relieved to hear that. Tigger is doing just fine. After drinking and eating, he returned to his normal routine. Mitch sent me this picture of him resting inside after he settled in. Hopefully, he won't be climbing any more trees. I want to give Mitch a special "Thank you" for all the work he did before I arrived. 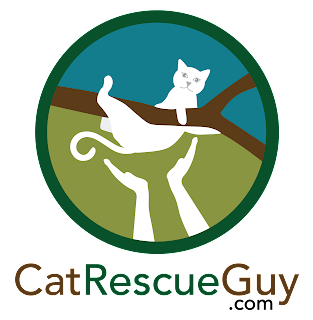 The tree that Tigger was in was in a wild, wooded area, and Mitch had cleared a path to the tree and an area around it so that I could work freely. In the heat of a very hot July afternoon, that is unpleasant work, and I am grateful to him for saving me from that trouble. Thank you, Mitch!